4C's,Four characteristics that determine the quality of diamond. The better these four characteristics,the more valuable the diamond will be. through the opposite side of the pavilion, or bottom, of the diamond. (2) If the cut is too shallow, then some light will escape through the pavilion, or bottom, before it can be reflected. 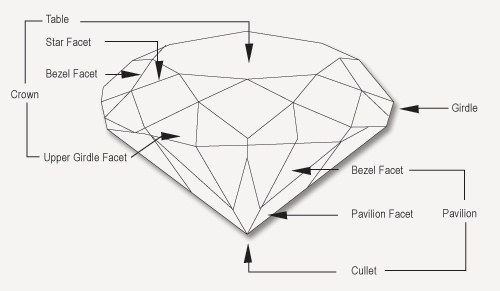 So a well cut diamond is comprised of facets with the correct angles, which ore perfectly placed to maximize the diamond’s brilliance. It is the quality of the cut and its final polish that unlocks the hidden beauty. 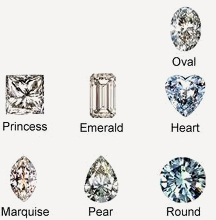 There are many shapes and sizes of diamonds. But whatever the shape or size, the cut is the only human element. A diamond cut to good proportions will have more value then one which is not. Most diamonds look colourless, but there are many subtle shade differences and the closer a diamond is to having no colour the more valuable it becomes. Why does the colour vary? Well, in the chaos of extreme temperature and pressure that first created diamonds, traces of elements such as nitrogen and boron could have been incorporated into the diamonds atomic structure. or lack of it. Diamonds with a hint of colour at all are very rare. But also rare are diamonds with strong colour. These are called ‘Fancies’. Red, pink and blue ore the most prized, but virtually all colours are possible. Most gem quality diamonds, seen on their own, may well appear to be colourless. But usually they do have at least a hint of colour this is normally yellow or brown due to traces of nitrogen. Thanks to nature, every diamond is unique. Each one possesses its own individuality This could be due to minute traces of other minerals trapped during the crystallization process. These natural characteristics, called ‘inclusions’ are better described as nature’s fingerprints and help gemologists determine the age of a diamond. The number, colour, nature, size and position of any inclusions determines the clarity of a diamond. The fewer the inclusions, the rarer it will be graded, and the more light it will reflect making it more valuable. Since it is very rare to find a diamond that has no inclusions, the closer to flawless it is the greater the value. The last of the 4Cs is Carat Weight. 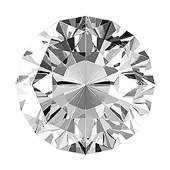 A diamond’s weight is the simplest of its characteristics to measure, and from the earliest times has been used to calculate one aspect of the value of a diamond. The carat is a unit of weight which derives from the carab seed. The pods of the carab, or locust tree, contain flay seeds which are remarkably consistent in weight. These seeds were used by early gem traders to weigh their diamonds. A 1 carat diamond used to equal the weight of a carob seed, but in today’s terms the carat is a standard metric weight of weight of 0.2 grams or 1/142 of a standard ounce. Each carat is divided into 100 points. So, for example, a quarter of a carat is 25 points, written as 0.25; a half a carat is 50 points, written as 0.50, and so on. It is easy to weigh unmounted diamond, but once it is in a setting, it is only possible to estimate its weight by using special gauges and formulae. Remember,Carat Wieght has no bearing on a diamond's cut,colour and clarity.